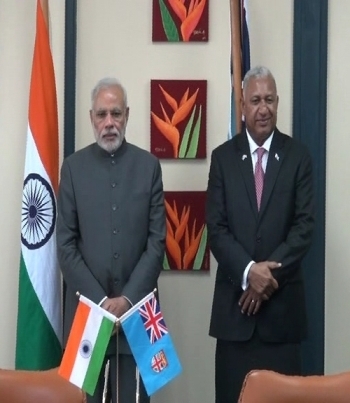 Prime Minister Voreqe Bainimarama is expected to meet his counterpart Narendra Modi in India later this week. Bainimarama is attending the Forum on India-Pacific Islands Cooperation in Jaipur where 14 leaders from the Pacific are expected to meet. The summit will be held from 20th – 21st August in three different cities across India to discuss ways to enhance India’s relationship with Fiji and other Pacific Island states. Bainimarama will use this opportunity to seek India’s support for this year’s climate change talks in Paris, France. In a congratulatory letter to Modi yesterday, Bainimarama sought India’s leadership on Climate Change- a great issue affecting the world especially the Pacific. Bainimarama highlighted that Fiji and its neighbors intend to spearhead the campaign for binding cuts in carbon emissions at the World Climate Summit at the end of November. He says India’s support will be of great importance to the well being and the very survival of some Pacific nations.